Holm oak (Quercus ilex L.) seedlings were exponentially (E) nutrient loaded using incremental increases in fertilizer addition or conventionally (C) fertilized using a constant fertilizer rate during nursery culture. The fertility treatments (mg N plant−1) were control (0), 25E, 100E, and 100C. Subsequently, 1-year-old plants were transplanted under simulated soil fertility gradients in a greenhouse to evaluate effects of nutrient loading and post-transplant fertility on seedling performance. Post-transplant fertility consisted of fertilizing plants at two rates (0 vs. 200 mg N plant−1). A water-soluble fertilizer 20-20-20 was supplied in both nursery and post-transplant experiments. Nutrient loading increased plant N content by 73% in 100E and by 75% in 100C relative to controls, although no significant differences were detected between constant and exponential fertilization regimes at the 100 mg N plant−1 rate. When transplanted, nutrient loading promoted post-transplant root growth relative to shoot, implicating potential to confer competitive advantage to loaded holm oak seedlings after trans-planting. In contrast, post-transplant fertility increased new shoot dry mass by 140% as well as N, P and K content relative to controls. 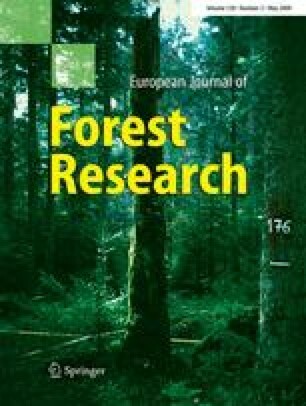 Results suggest that holm oak seedlings can be successfully nutrient loaded in the nursery at higher fertility rates, improving its potential to extend new roots, but alternative fertilization regimes and schedules that better fit nutrient availability to the growth rhythm and conservative strategy of this species must be tested. We gratefully acknowledge the financial support of the University of Córdoba and Andalucía Research Programs to promote research groups activities. Additionally, this research was partially supported by MEC project AGL2006-12609-C02-01/FOR.